Yuma, Arizona, is the sunniest city in the United States. Ninety percent of the time, residents bask in sunshine, while even a couple hours to the northeast, the Phoenix area still sees an annual average of 85-percent sunshine. 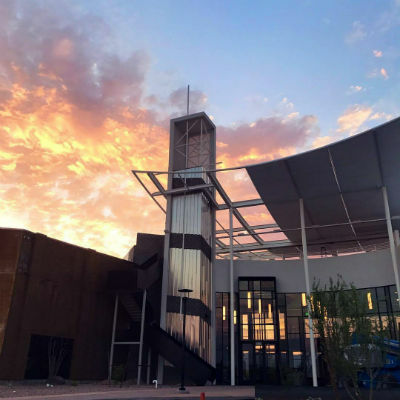 While no meteorologist or travel agency can guarantee beautiful weather, the odds are good that conditions will be pretty incredible for the kickoff Regional Convention of the Church of God in Phoenix, Arizona, April 17–18. I should know; I grew up just northwest of downtown. More on my experience later. For now, know that the local Church of God pastors are happy to invite the Movement to the Grand Canyon State this spring. This is, after all, the first time a Church of God Regional Convention has come to the Southwest and, for many persons-in-the-pew unable to travel long distances, it may also be their first taste of the broader Movement. Speaking of taste, you’ll want to savor some of the flavors of Phoenix, see some of the unique sights, and smell some of their creosote bushes (the delightful, defining scent of the desert). So, before you book travel for the Regional Convention, consider the recommendations of a few of our Arizona pastors, and the possibility of arriving early or staying a few extra days. The writer’s meal at Mi Patio, central Phoenix. 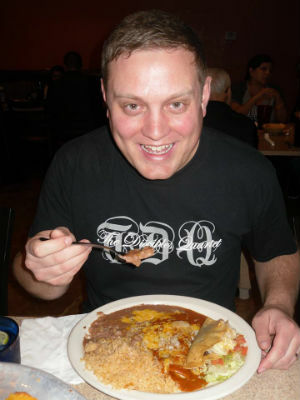 Michael Fay, one of the co-pastors at Arcadia City Church in Phoenix, says Gadzooks offers a “taste of the Southwest,” and cites the buffalo-meat enchilada as especially delectable. If you’re up for a bit of a drive, Paul Johnson, pastor at The Gathering Place in north-central Phoenix, recommends The Yard. If you like barbecue, Hector Gonzalez, who shepherds the flock at Nueva Vida Church of God in the suburb of Glendale, insists the drive to neighboring Gilbert is worth it for Joe’s Real BBQ. Don Wilson, guest speaker for the Phoenix and Oklahoma City Regionals, is also from Phoenix—and suggests visitors try Ocean Prime and Kona Grill (for each, allow more travel time). Mike Hodges, who pastors West Side Church of God in Glendale, says The Old Spaghetti Factory and Rustler’s Rooste aren’t far from the convention site and won’t leave guests disappointed. Arizona’s regional pastor Don Doe agrees with Pastor Mike: Rustler’s Rooste is great, especially if you also want views of the city, a western theme, and/or would like to try fried rattlesnake and cactus fries. The writer atop South Mountain, just north of Mountain Park Church. Looking to do something uniquely Phoenix? 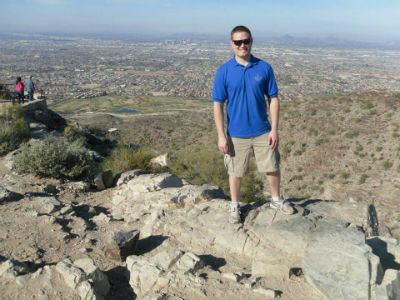 Two local pastors—Allan Fuller and Michael Fay—say a hike to the summit of Camelback Mountain is worth the 360-degree view of the city (I approve this message). But, warning: this one’s not for the faint-of-heart (or the out-of-shape!). Fortunately, a scenic drive to the top of South Mountain (which is actually north of Mountain Park) offers an easy alternative (and even more hiking trails for all skill levels, all within minutes of the convention site). The writer enjoying Mexican food at El Comedor Guadalajara, south Phoenix. As the introduction to this article hints, the writer of this article is, in fact, a Phoenix native. Born and raised up in the Church of God in Arizona, one of the most anticipated summer vacations was the cross-country drive to gather with the saints from near and far in Anderson, Indiana. But upon our return to the Valley of the Sun, we had to satisfy our taste buds for that which we simply couldn’t find anywhere else: mouth-watering, authentic Sonoran-style Mexican food. 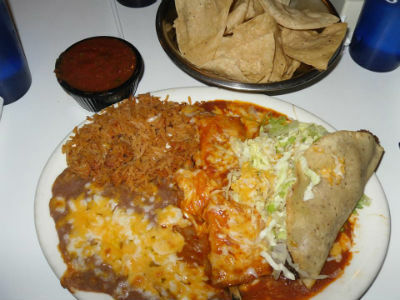 Don’t leave Phoenix without trying one of our excellent local Mexican eateries! My favorite: Popo’s Fiesta del Sol. If the drive to my favorite requires too much drive time, I also recommend Los Dos Molinos, just up the road from Mountain Park. But beware: Los Dos Molino’s only knows how to make it hot! South Mountain Park is practically in the backyard of Mountain Park Community Church—you’ve got to check it out! The Hall of Flame Museum, Organ Stop Pizza, and the easy hike to the Hole in the Rock at Papago Park also make for memorable experiences. If you’ve never seen Sedona or the Grand Canyon, consider making a vacation out of your Phoenix Regional Convention experience—just plan for several hours on the road. Early-bird registration for the Phoenix Regional Convention ends February 15. Early-bird registration for the Oklahoma City Regional Convention ends February 22. Register now at www.chogconvention.org. This entry was posted in All Church of God, Church of God Convention and tagged Allan Fuller, Arizona, AZ, Don Doe, Don Wilson, eat, food, Hector Gonzalez, Michael Fay, Mike Hodges, Mountain Park Community Church, Paul Johnson, Phoenix, Regional Conventions 2018, things to do, travel, visit. Bookmark the permalink.